New to the Koh Chang property market, this luxury villa on the east coast is now available at a reduced price for a quick sale. Built in a U-shaped lay-out over two floors, the luxury villa has 4 double bedrooms, 6 bathrooms, kitchen, dining area, living room, balcony and outdoor terrace. At the villa centre sits a fabulous rectangular infinity pool, from which lawned gardens lead down to the ocean. Freehold. Luxury comes to the Koh Chang property market with the arrival of this fabulous villa for sale on the east coast. On the ocean front, this huge family villa is built over two floors, with 4 bedrooms, 5 bathrooms, dining room, living room, fitted kitchen, infinity swimming pool. Available now. On the quiet Koh Chang east coast, this elegant 2 storey house for sale is an exciting new addition to the Koh Chang property market. House comprises 4 bedrooms, 3 bathrooms, living room and kitchen, all laid out over 2 floors, fully air-conditioned, terraces for outdoor seating and those ocean views. Available for immediate sale, this small resort on the Koh Chang west coast comprises of 8 villas and restaurant. An excellent turnkey business. Long lease. Now open to immediate offers, this intimate resort represents a terrific turnkey business opportunity. Located in one of the island’s quieter areas on the west coast, the resort comprises 16 rooms, swimming pool, fitted kitchen and restaurant as well as staff accommodation. All fixtures and fittings included. Located just 3 minutes walk from one of Koh Chang’s prettiest beaches, this fabulous bungalow resort is now available for immediate sale. Assumable existing lease, room for development, can open for business tomorrow. Now open to immediate offers, this well established backpacker resort has 25 bungalows as well as an existing shop and snack bar. It represents a perfect turnkey business or there is also plenty of room for expansion, with more street-facing land for rental units, space for a swimming pool and the addition of a restaurant. All fixtures and fittings included. Long contract, excellent rate. 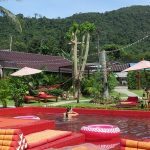 More details on Koh Chang Property and Business for Sale?